This infrared image shows the center of our galaxy and the stars orbiting what is thought to be a supermassive black hole at the galactic center. Likeballerinas pirouetting around an invisible leader, a collection of stars orbitsour galaxy's gravity sink, or black hole. New infrared images of the cosmicdance confirm that this supermassive black hole weighs as much as 4 millionsuns. Supermassiveblack holes can weigh as much as a billion suns or more and are thought to resideat the centers of most, if not all, galaxies. They can't be seen, becausetheir gravity is so powerful it traps even light, but astronomers infer theirpresence by watching the motions of stars and gas around them. Over aperiod of 16 years, beginning in 1992, researchers monitored 28 stars orbitingthe Milky Way's central region, where the supermassive black hole called SagittariusA* is thought to lurk. By watchinghow the central stars orbited Sagittarius A*, to which they are gravitationallybound, the researchers inferred properties of the black hole itself, such asmass and distance. 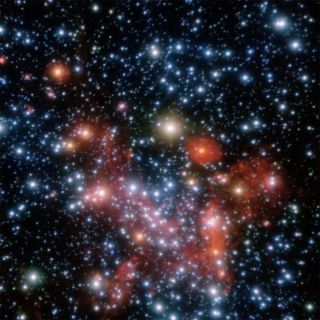 They found that at least 95 percent of the mass affectingthe stars must be within the black hole. Results gave a precise distance of27,000 light-years from Earth to the presumed black hole. One light-year is thedistance light will travel in a year, or about 6 trillion miles (10 trillion km). "Undoubtedlythe most spectacular aspect of our long-term study is that it has deliveredwhat is now considered to be the best empirical evidence that supermassiveblack holes do really exist," said team leader Reinhard Genzel of theMax-Planck-Institute for Extraterrestrial Physics in Germany. The newimages also reveal common properties among the orbiting stars. For instance,the team found the innermost stars trek around the black hole in random orbits,while six of the 28 stars, which reside farther out, orbit the black hole inthe same plane, just as our planets mostly do around the sun. Oneparticular star, known as S2, orbits the Milky Way's center so fast that itcompleted one full revolution within the study's 16-year period. Theresearchers hope to continue to study the dancing stars to solve a long-heldriddle as to how such stars ended up in their orbits about Sagittarius A*. Theyare too young to have migrated far, and scientists think it's improbable thestars formed in their current orbits where they'd be exposed to the extremetidal forces of the black hole. Oneexplanation put forth recently is that the stars formed out of materialthat survived after a gas cloud plunged in toward the central black hole.This scenario was based on computer simulations. The researchers suggest thatthe six stars orbiting in a disk formed about 6 million years ago in thisgas-cloud scenario. Theinnermost stars could have once been in pairs, said lead researcher StefanGillessen, also of the Max-Planck-Institute. And so when the binary stars gottoo close to the supermassive black hole, the gravitational energy may havebeen shuffled around between the stars. In that way, one member of the pairwould've been kicked out while the other remained. These innermost stars ? eachmissing a partner ? are estimated to be about 50 million years old. The recentfinding involved observations in 1992 with the SHARP camera aboard the EuropeanSouthern Observatory's New Technology Telescope at the La Silla observatory inChile; and more recent observations using instruments aboard ESO's Very LargeTelescope.